ToiletThink it’s a Sieropositivo.it’s initiative against the spread of HIV virus amongst women. Le più recenti statistiche mostrano come i casi di HIV attribuibili a rapporti sessuali non protetti sfiorino il 78,8%. E secondo le nuove diagnosi le donne italiane paiono essere le più colpite, con tassi d’incidenza in costante crescita. These efforts by the British government signal more widespread acceptance for QR Codes and various mobile technologies – a bridge from historic events to our smartphones. 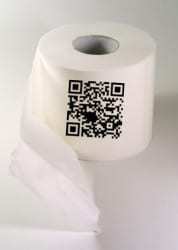 The manufacturer of the products has announced that its labels will now be smartphone friendly. CRC Brakleen manufacturer,CRC Industries, has announced that it has launched a whole new look for the packaging of its DIY penetrants and lubricants which includes QR codes to allow smartphone users to gain more information about the products. The new packaging has already been added to the products, which are now on the shelves and bays in repair shops. The marketing manager for the company, Dori Ahart, explained the strategy for changing the product packaging and adding QR codes by saying that “The new look is more retail-friendly, yet still easily recognizable as CRC, a brand that professionals have trusted for more than half a century.” Ahart went on to say that the new product labeling provides a prominent display of the item while highlighting its primary features. It was pointed out that the QR codes will be important for helping customers access additional information.